Caught this on the internets the other day and almost had a moneygasm! It comes from the beautiful mind of Sarah Lazarovic, and thought we’d marinate on it for a bit as it’s pretty epic… Link to download the high res version is down below if you want to print or share it around. Would make an excellent companion piece to that high school money class too! #1. Use what you have — Yup, best place to start! It’s not always the most fun or shiny, but it sure is the most economical (and useful). 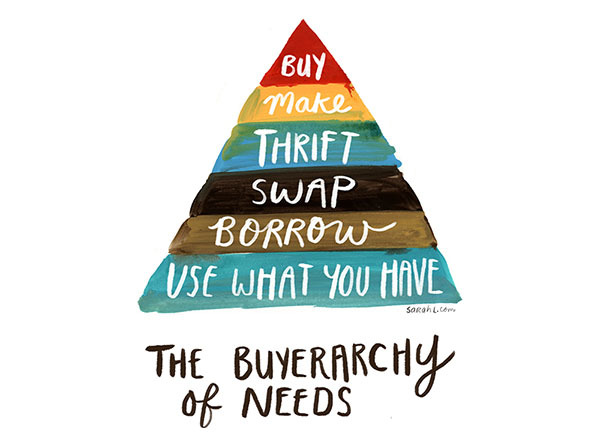 Our households are all overflowing with stuff, and half the time we probably own whatever we’re looking for anyways! Shop your house before going anywhere else! #2. Borrow — BOOM. What’s better than paying to use stuff? Not paying to use stuff! There’s libraries of course for books and movies/etc, but there are plenty of other forums for borrowing items too. Check out places like NextDoor.com or local Facebook groups to see what people are lending around to each other. #3. Swap — Another fine idea, and one where you actually get to KEEP the item in need! ;) I’ve heard of parties where you get together and swap clothes or books or even toys, and I’m just waiting for an invite as I got quite a few of the latter that I’d love to put in use again… A “new” toy in the eyes of a kid just means “new to them,” making it like Christmas anytime you bring home something! Haha… I could probably find a headless batman on the side of the road and it would excite the pants off them. #4. Thrift — I’m assuming this means doing without/less or getting creative (or maybe even hitting up thrift stores?) but in any case you can never go wrong inserting “thrift” into any part of life. It’s been around for hundreds of years and people survived just fine! #5. Make — Can’t find what you need from your home or friends? Get crafty with it! Learn something new and feed your brain at the same time. These days you can learn how to do practically anything with a quick Google search. 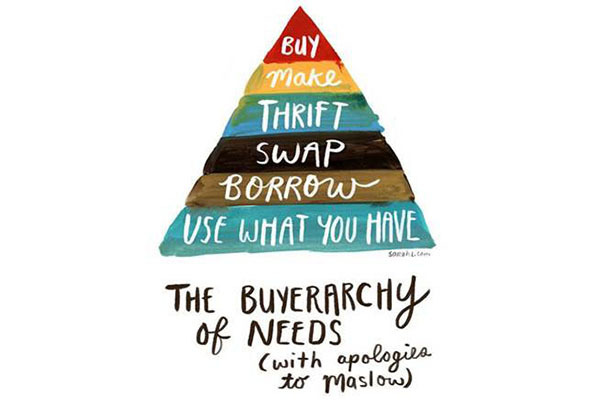 At any rate, there you have it – The Buyerarchy of Needs! 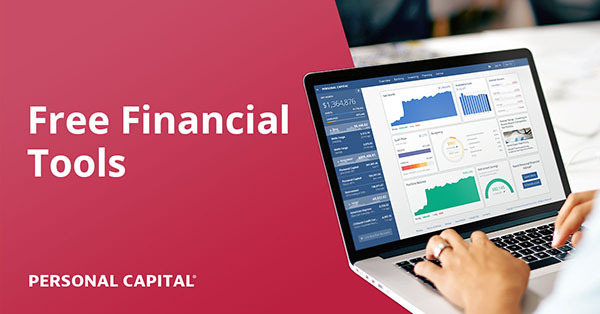 It may not make you wealthy, but it’ll sure help speed up your savings! And a good thing to keep in mind over the weekend too! She might be cool with us tattooing it, but woe to he who maketh it into a PIN! Love the illustration. An excellent reminder to quite buying stuff you really don’t need. If there’s any room in there, I’d slide one in under “buy” and call it “buy used.” A somewhat more environmentally friendly tactic. Love it. It is going on the fridge as a reminder! Great advice! If you have to buy new, shop it to death! We’re doing a partial remodel of our master bath. One faucet is totally shot. The other is on its’ way out too. So we “need” 2 new faucets. Saw one we liked at Lowe’s. NOT spending $598 for 2 faucets! Found the exact same model on Ebay on clearance. After I used my Ebay bucks, BeFrugal discount & 2% cash back on my credit card, the 2 faucets cost me $128. This does not include the future Ebay bucks I earned on this purchase. Using stuff we already have is a great way to change things up & repurpose things. I think people, including myself, tend to jump to buying without the other options since it takes more time and effort. For example, I know I like a certain kind of dress and can easily get it at the store. If I want to borrow or shop for it at a thrift store, I will need to spend time trying to find it. At least, it has been my experience. Yeah, for some more particular things it’s def. harder to find in other avenues. You can always create alerts from certain sites for when they do pop up though :) I do that for Ebay on stuff that’s hard to find and every now and then get lucky. If I have yet to get a VTSAX tattoo, I’ll probably hold off on this one for a while… but it’s nice to know the artist supports that sort of expression! For sticking around 10 years, my employer let me choose a gift from a brochure last year. So now I picked out a compound mitre saw. Walking my dog just last week, I saw the house at the other end of the block had a big box on their curb for recycling… they’d bought almost the exact same tool. I felt sad that I’d missed a chance to lend them ours and save them a few hundred bucks. Obviously we need to drink more beers with more neighbors more often. In the borrow category, there are tool libraries in many cities now too. I just found ours in Denver. woohoo! their $60 “member fee” was cheaper than what home depot wanted to rent a tiller, and now all year I can borrow whatever I need for no cost. and along the lines of your headless batman in your swap: some kid threw a footless batman onto our deck (with karate kick action!). We never did find out who’s it was, so it now sits on our windowsill in the dining room. EVERYONE plays with it. WHAT ARE THE ODDS??? Haha…. that is too funny… And very cool about those “tool libraries” too! What a cool idea! I’ve always had a similar idea, a garage where you can take your car, pay a fee, and then there are all sorts of tools/etc. provided that you can use to repair your car yourself. If it’s not obvious, I came up with this “genius” idea when I wanted to fix something on my car myself but didn’t have the tools to do it – “wouldn’t it be nice if…”. But it’s cool to see there’s at least one place that’s doing something sort of like that. Good point, just be careful on the BORROW category so not to be that neighbor that always comes over and borrows tools and lawn equipment, and ends up having a reputation of the person that nobody wants to answer to door for. Your suggestions seem a little more geared toward people looking to actually borrow their stuff out, but I know for others, they miss that fine line. For sure :( All about the GIVE and the get too – can’t be just one-sided! Love this! I take thrift to mean buy it used from someone else, like a garage sale, a thrift store, or even from eBay, FB groups, or one of the tons of resale apps that are out there now. Technology is great for matching up people who want to get rid of something with people who would love to have it for little or sometimes no money at all. It’s also great for finding how-to’s if you want to make it yourself. You might be right on that one… And would explain why “Buy” isn’t broken down to “Used” vs “New” too. Or perhaps we’re all just overthinking it and should take the simplicity and beauty of it as-is, haha… It def. hits home the point! Unfortunately, I’ve seen too many well-paid people “borrow” office supplies at my old workplace. 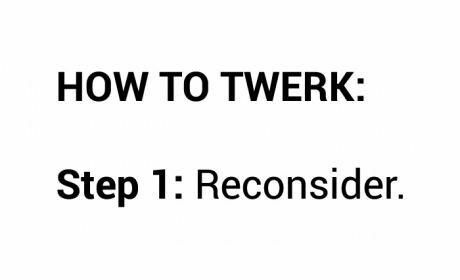 So I’d personally put borrow at the very top and call it “Borrowarchy”. Unless of course, I’m borrowing from the library. Haha… I remember those days too… people go bananas for office supplies. There’s a tool library in Denver? Gotta look into this. The Batman sounds very cool. Sarah’s article reminds me of that saying, “Use it up, Wear it out, Learn to make do, Or do without.” This list looks like it could apply to groceries as well. Use what you have ( I can always find something hidden behind a can or frozen whatamacallit), Swap (I take that as barter,which I’ve done with my walnut tree), Borrow (major blizzard one year and neighbor needed milk), Thrift (I take this as using a outlet bakery, salvage mart or even the clearance area at the market), Make (I’ve become pretty good at making all kinds of breads, rolls, croissants, pies, stews, soups) and Buy (as needed).It does help in the money saving department and even if it doesn’t make us wealthy, it can make us healthy(er). Yup yup yup! Can be applied to all kinds of areas in our life! And love that you have a walnut tree! Love it! 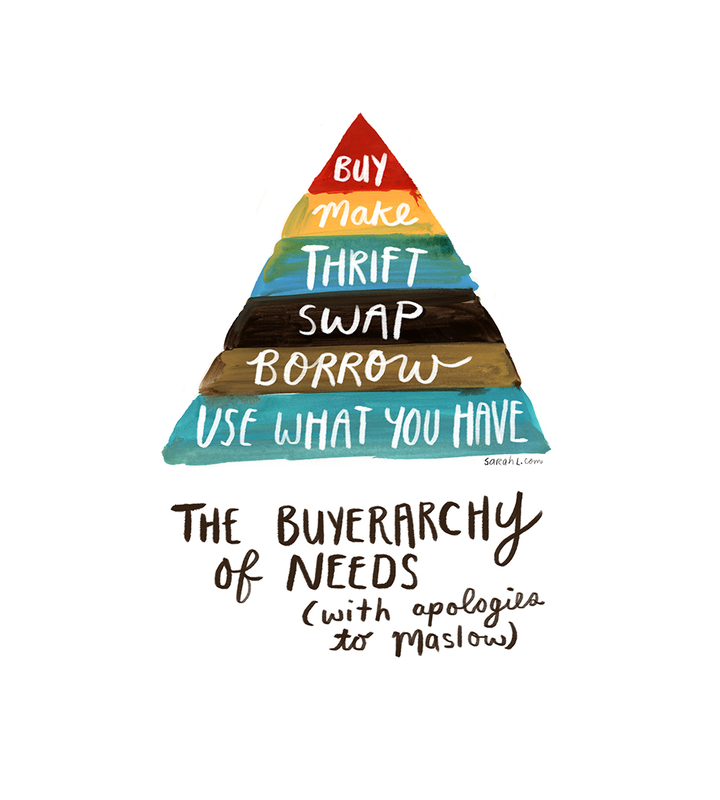 Converting the hierarchy of needs to the “buyerarchy”.. And of course, I’m mostly in the red level. Browsing thrift shops is one of life’s simple pleasures and finding something you need for pennies on the dollar well, that induces in me something akin to a runner’s high in the more athletic. Next post: Ever try tracking what you spend on *wants*?